Hemochromatosis is a fairly common genetic disease that causes iron to build up in the body. Knowing that you carry the genetic variants for hemochromatosis can literally add years to your life since you can prevent the buildup of iron through giving blood. This is a personal cause for me, and getting the word out to as many people as possible is important because this is one bit of genetic information that can make a huge impact on the quality of life. The most common type of hemochromatosis is Type 1, or Classic, and is usually caused by variants in the HFE gene. So you’ve checked your genetic data and found that you are heterozygous (one variant) for one of the HFE variants… While most of the official hemochromatosis sites will say that you are ‘just a carrier’, in actuality, it could be causing problems, just not to the extreme extent that being homozygous for the variant could cause. Doctors and researchers seem to be focused (rightly so) on the long-term consequences such as liver failure and heart failure of extreme iron overload. But if you know that you genetically susceptible to building up iron, you can take action to avoid the irritations that come with too much iron, such as random joint pain, fatigue, and/or abdominal pain. The Iron Disorders Institute includes these signs and symptoms of too much iron: chronic fatigue, joint pain, abdominal pain, liver disease, diabetes, irregular heart rhythm, skin color change, hypothyroidism, enlarged spleen, elevated blood sugar and more. Middle-aged men and menopausal women who are heterozygous or homozygous for any of the HFE variants, should, in my non-medical doctor opinion, go get their serum iron, TIBC, and ferritin levels checked or ask their doctor to test them. In the US, you can order your own labs online through places like www.walkinlab.com. Ordering serum iron w/ TBIC and ferritin should give you enough information to know if you are storing too much iron. If you have slightly elevated iron levels, the simplest way to manage iron levels is to give blood! You will probably feel good, and you will definitely help out someone else with your blood donation. If your iron test levels are really high, go to a doctor. Seriously. Quercetin, a flavonoid found in fruits and vegetables, has been studied for its iron chelating properties. [ref] A 2017 study on dendritic (immune system) cells found that quercetin “increase extracellular iron export, resulting in an overall decrease in the intracellular iron content and consequent diminished inflammatory abilities.” And a 2014 study on quercetin concluded: “Potentially, diets rich in polyphenols might be beneficial for patients groups at risk of iron loading by limiting the rate of intestinal iron absorption.” Foods high in quercetin include apples, dark cherries, tomatoes, capers, onions, and cranberries. Quercetin supplements including pure quercetin powder are also readily available. Another flavonoid, rutin, has also been studied for its iron chelation properties. [ref] A 2014 study in rats found: “Rutin administration to iron-overloaded rats resulted in significant decrease in serum total iron, TIBC, Tf, TS%, ferritin levels…” Foods high in rutin include capers, black olives, buckwheat, asparagus, and berries. Rutin is also available as a supplement and in bulk powder. Okra: A 2015 study found that okra “dramatically decreases intracellular iron levels in H63D cells compared to untreated cells”. [ref] Time to make some gumbo! Taurine, in a mouse model of hemochromatosis, was found to protect against liver damage from excess iron. The study is worth reading and looking into if you are worried about iron-induced liver damage. Iron Fortified Foods…May, or may not, be a problem for those carrying the hemochromatosis genetic variants. In the US, white rice and refined wheat products are fortified with iron. A Swedish study looked at the effect of iron-fortified foods on iron absorption in men with hemochromatosis. The study found that eliminating iron fortification from foods significantly reduced the iron absorbed by the men in the study. The study also found that the time needed between phlebotomy (to maintain proper iron levels in hemochromatosis patients) was increased significantly. A few studies have looked at the impact of the overabundance of iron on obesity. But while the risk for each of these diseases increases with higher ferritin levels, no one seems to be publishing studies showing that iron fortification is causing them. 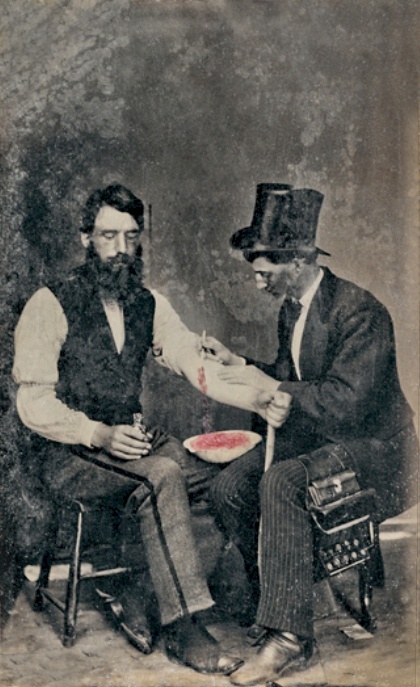 Bloodletting in 1860. Public domain photo from Burns archive. It hit me while researching all of this, that the bloodletters of yesteryear probably did some good for the minority of people who were overloaded with iron. Leeches to reduce blood and iron stores were probably effective against bacterial infections from iron-loving bacteria. Fortification of iron into all wheat product in the US, which began in the 1940’s, is good for children and most women of childbearing age, but it adds to the iron overload burden for some men and older women. When looking at the forced fortification of foods with iron and folic acid, it really does seem that the policymakers are focused on the majority, at the expense of a minority who genetically are harmed by it. Since iron can takes decades to build up in the body, it may be that we are now seeing the consequences in the baby boomer generation. Multi-target iron–chelators improve memory loss in a rat model of sporadic Alzheimer’s disease. The impact of H63D HFE gene carriage on hemoglobin and iron status in children. Eighty percent of French sports winners in Olympic, World and Europeans competitions have mutations in the hemochromatosis HFE gene. Curious why some of these are called: CC: normal / wild-type? If normal, why do they refer to them as ‘wild type ‘? Have you looked into rs2280673 in the RAB6B gene? I read something there that it may play a part with iron overload/toxicity. I need a 23&me for dummies book….if possible, maybe someine can make this easy. So, if 23andme shows, A / G, what is G? How does one determine if the gene is normal, heterozygous or homozygous? Sorry about this third comment, but it might be interesting for some. I am so glad I stumbled onto this article! Thanks for the heads up on this. I’ll get it fixed to link to the right spot on 23andMe. I inherited the H63D gene from my carrier mother….whose father died from hemochromatosis complications. I am female, over 50 y.o. Unfortunately, my one pesky little HFE gene has given me dangerously low TIBC, and dangerously high hemoglobin and hematocrit. Knowledge is power, however. I can take action to correct this. Thank you for all your hard work and research. You are helping people stay healthy! Thanks so much for sharing your experience! It is important that people know that being heterozygous (a carrier) can lead to higher levels. And you are so right – both that knowledge is power and that you then have to act on that knowledge.